Summary (from the inside flap of the book): In middle school, words aren't just words. They can be weapons. They can be gifts. The right words can win you friends or make you enemies. They can come back to haunt you. Sometimes they can change things forever. When cell phones are banned at Branton Middle School, Frost and his friends Deedee, Wolf, and Bench come up with a new way to communicate: leaving sticky notes for each other all around the school. It catches on, and soon all the kids in school are leaving notes--though for every kind and friendly one, there is a cutting and cruel one as well. In the middle of this, a new girl named Rose arrives at school and sits at Frost's lunch table. Rose is not like anyone els at Branton Middle School, and it's clear that the close circle of friends Frost has made for himself won't easily old together. As the sticky-note war escalates and the pressure to choose sides mounts, Frost soon realizes that after this year, nothing will ever be the same. Review: I was so excited to read this book. Our schools have recently gone one-to-one with iPads so schools are going to try to ban cell phones next year. My point is that when I was in school I wrote notes pretty much all day in every class and no one took away my pen or paper. And now there's this book! Perfect! But this book is so much more than just a post-it war (which is what it becomes). It's about friendship, middle school, bullying, fitting in, and not being a bystander. 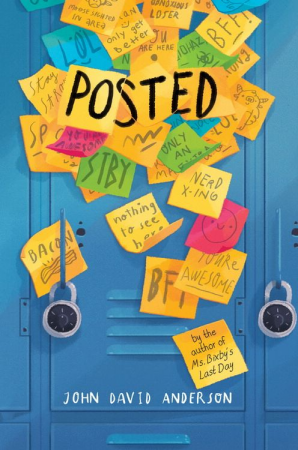 That's a lot to take on, but the author managed to fit all that into a story about a great group of friends--a tribe--who are trying to figure out how to get through middle school as unscathed as possible. I like that they each had their talent, their issues, and they stuck up for one another, mostly. This is a good story with great characters and a strong and important message.